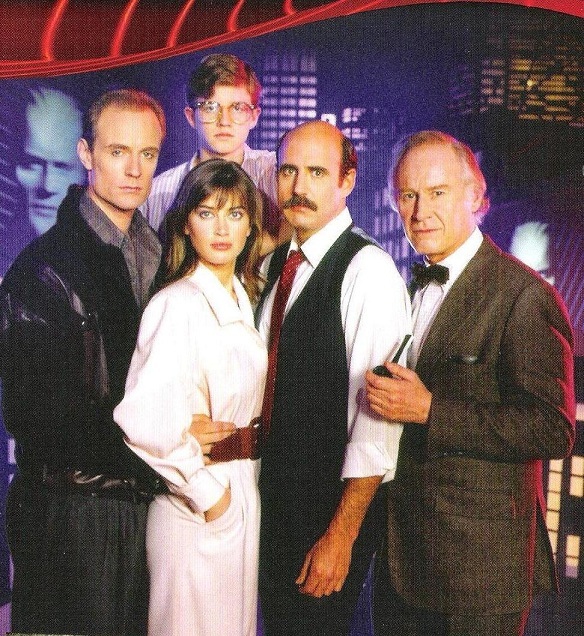 MAX HEADROOM – THE COMPLETE SERIES: Future Shock’s Nostalgic Afterglow – Schlockmania! Despite its dedicated cult following, the rest of the world seems to remember Max Headroom as an 1980’s fad or a marketing gimmick. They have good reason for this because the Max Headroom image and character was aggressively marketed, with this televisual apparition serving as everything from a pitchman for New Coke to a chat show host. There was even an incident where a video pirate interrupted some television broadcasts in Chicago to yuk it up while wearing a Max Headroom mask. The aforementioned marketing barrage makes it easy to forget how good the actual programming involving the Max Headroom concept was. The character was originally created to host a music video show in the U.K. and an accompanying television film was produced to explain his origin story. The result became an international phenomenon culminating in a series that ran on ABC for two abbreviated seasons during 1987 and 1988. The latter format offered the creative minds behind the show the most expansive possibility to explore their future-shock concepts and the result was one of the best, most forward-thinking and subversive science fiction shows ever telecast. 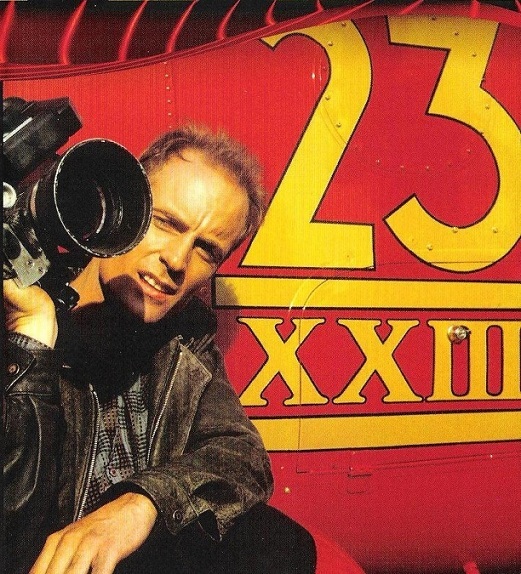 The series kicks off with a condensed redux of the Max Headroom origin story: Edison Carter (Matt Frewer) is an investigative tele-journalist with a brash, hard-hitting style that has made him the star of Network 23. While trying to get to the bottom of a citizen’s mysterious death, he stumbles across a conspiracy involving “blipverts.” This name refers to a 30-second ad that is compressed into 3 seconds. The results are effective but they also have the unfortunate side effect of making more sedentary viewers explode. Unfortunately for Edison, his meddling is discovered by Grossberg (Charles Rocket), the sleazoid Network 23 exec who cooked up the “blipvert” concept. He tries to get some security goons to bump Edison off and Edison is injured in a motorcycle crash while trying to escape (the last thing he sees are the words “Max Headroom” on a security gate). Grossberg has the network’s research/development genius, a 13 year-old named Bryce (Chris Young), to scan Edison’s brain while he’s unconscious and then feed the results into an experimental personality-simulator program. The result is Max Headroom, a jittery, motormouthed “talking head” with a computer-animated face and part of Edison’s personality. 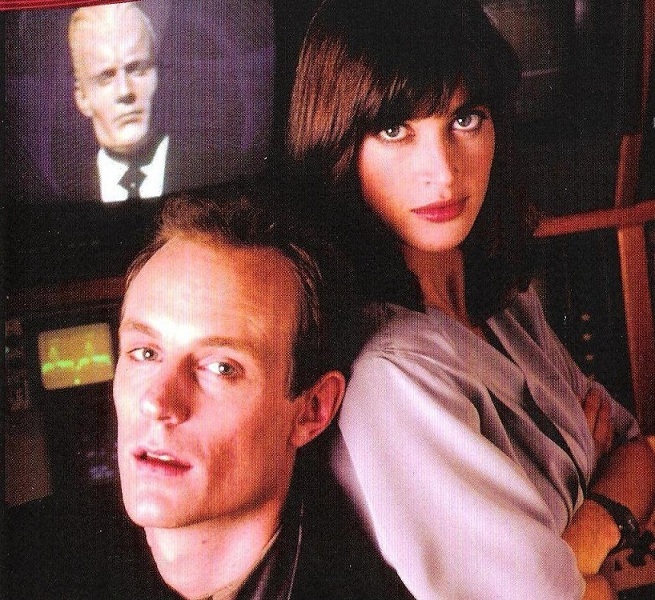 Meanwhile, Edison’s body is shipped off to be sold for parts at a body bank but he is saved in the nick of time by Edison’s new partner, the lovely Theora Jones (Amanda Pays). With the help of Theora and show producer Murray (Jeffrey Tambor), Edison ge ts it together in time to confront Grossberg. The final piece of the puzzle is supplied by Edison’s new alter ego, Max, who runs freely within the network’s computer systems and lends support in a way that’s deranged and on-target all at once. Viewed today, this pilot episode has a certain retro charm thanks to its music video-derived look but it’s amazing how forward-thinking it was in how it anticipates virtual reality, the way up-to-the-moment marketing drives corporate thinking and a world where multiple computer platforms control every element of life. It’s also hard to believe that something this critical of corporate thinking and television networks made it onto late-1980’s televsion. The rest of the season continues along similar lines: each episode is a self-contained affair that tips its cap to the requirements of episodic television by having Edison face off with crisis/conspiracy of the week. However, the show’s creators wisely twist the format to fit their own philosophical agenda. There are episodes that deal with the morality of televangelism (“Deities”), the sometimes co-dependent relationship between terrorists and news networks (“War”) and a critique of genetic engineering (“Baby Grobags”). These storylines are also dense with the details of a fully-conceived future world that is sometimes overwhelming, but in a good way: it’s work to keep up with this show’s conceptual speed but it’s also very rewarding. And that’s not where the narrative complexity ends. Each episode features a subplot that revolves around the personal lives of its characters. For instance, “Dream Thieves” has Edison and Murray confronting how their personal a mbitions negatively impacted the life of a former co-worker and “Neurostim” features a dramatically vivid subplot in which Edison is forced to come to terms with his feelings about having to share his life and career with his uncontrollable alter ego, Max. Each storyline is rich enough that it could have been expanded to feature-length yet it is disciplined enough to play satisfactorily within a 45-minute time frame. Given the problems with consistency that dogs even the most classic of television shows, this is a big, big achievement. It helps that Max Headroom boasts a superlative production design and visuals for its era. The future world presented here takes conceptual and visual cues from Blade Runner and Brazil, with dashes of The Road Warrior and Videodrome thrown in for good measure, but it manages to blend these influences into a coherent and convincing style. Early computer animation is used to impressive, narrative-advancing effect and fans of old-school visual techniques will be delighted by the scale-model shots used to depict the show’s futuristic metropolis. However, the key element that sells Max Headroom is the quality of its performances. The title figure may be the show’s calling card but all the supporting cast turn in vivid, richly-drawn performances: Pays does a subtle job of selling Theora’s intelligence and moral center, Tambor delivers both deadpan comic timing and surprise flashes of dramatic intensity as Murray and Young brings a subtly-drawn humanity to his boy-genius character. There are also distinctive performances in key episodes by Rocket, who delivers a sly variation on the “evil executive” conceit as Grossberg, and also by William Morgan Sheppard as Blank Reg, an aging rocker with a charmingly rebellious persona who runs his own low-power t.v. station in the show’s forbidden zone. The quick-eyed will also notice Howard Sherman (Bub from Day Of The Dead!) popping up as a network-owned politician and one-off performances by everyone from Dayle Haddon to Bill Maher. That s aid, the show is truly driven by Matt Frewer’s dual performance as Edison and Max. Frewer invests Edison with a mixture of brooding intensity and world-weary sarcasm, making him a “wiseass with a heart” that we can root for. He also fittingly uses Max to balance out Edison’s single-mindedness by investing him with carefully-controlled bursts of wacked-out humor and a knack for improvised, free-associative quips that often comment ironically on the episode’s events. It’s a testament to both Frewer’s performance and the quality of the writing that Max never comes off as a cheap gimmick. This character is used at a different times as a Greek chorus, a conscience to different characters and a featured player within the show’s ensemble. Thanks to Frewer’s comedic gifts, Max fills these multiple roles with ease. 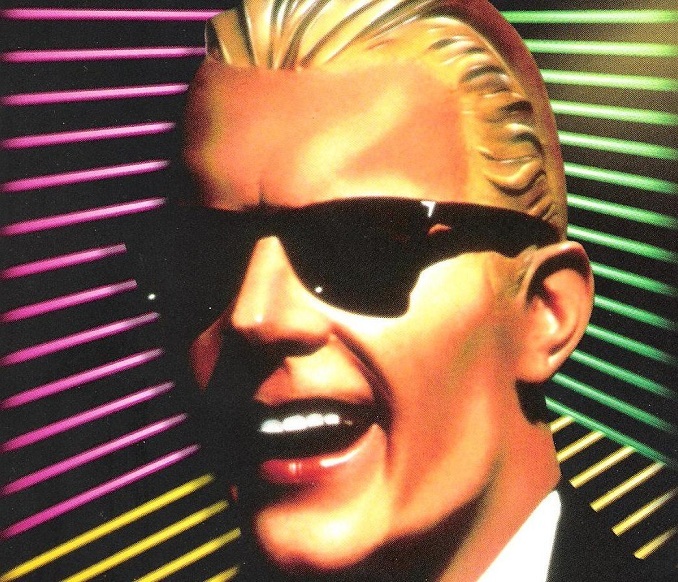 In short, Max Headroom is one of the all-time greats in the world of science-fiction television. If you thought he was just a gimmick, think again – and check out this fascinating show to get the full story. Order from ShoutFactory.com and get a limited-edition 8″ x 10″ glossy cast shot! Offer valid while supplies last.